David Atkins (@DavidOAtkins), is the Chairman of the Ventura County Democrats. Atkins spent his 4th of July weekend tweeting out racially incendiary, inappropriate, and offensive comments about Republicans and conservatives, including comparing them to Nazis, discussing genitalia size, saying Republicans want black voters to get fire hosed, and writing demeaning comments about conservative women. Atkins believes Republicans firehosed blacks. 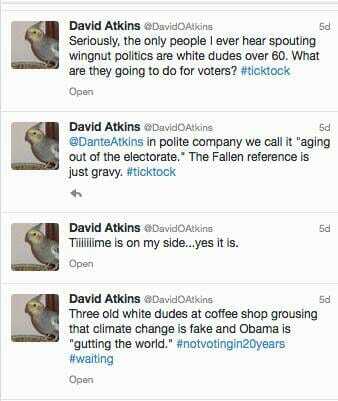 This comes on the heels of Atkins’ tweets from last week, where he expressed his glee that old, white (Republican) voters are dying with the #TickTock hashtag. Yesterday, the NRCC asked that Julia Brownley immediately condemn his incendiary and vitriolic comments. As the leader of the Democrat Party of Ventura County, other elected Democrats would (hopefully) expect better.